A recipe for made from scratch Fat Man's Pie aka Chocolate Delight. 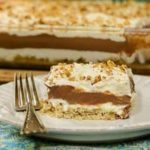 Layers of cream cheese, chocolate pudding, and whipped cream over a pecan crust. Stir together flour, pecans, and salt in a large bowl. Use a fork to cut in the butter until mixed together well. Spread evenly and press down in a 9- X 13-inch pan. Bake for 20 minutes. Cool to room temperature then chill for at least 1 hour before adding cream cheese layer. Beat cream cheese and 1 cup confectioners sugar until light and fluffy. In a separate bowl, beat heavy cream and remaining 1/4 cup confectioners sugar until stiff peaks form. Fold whipped cream into cream cheese. Spread evenly over crust. Chill for at least 45 minutes. Put the 2 cups of milk, yolks, flour, and salt in a blender. Blend until smooth. Pour into a 3-quart saucepan (non-stick recommended). Add remaining 2 cups milk, sugar, vanilla bean, and chocolate. Slowly bring to a boil over medium heat, stirring constantly. Let boil for 30 seconds. Pour the mixture through a strainer into a large bowl. It will be very thick so you may need to press it through. Scrap the seeds from the vanilla bean and discard bean shell. Add the seeds, cream, and brandy to the bowl. Whisk to combine. Place plastic wrap directly on top of the pudding. Cool to room temperature then chill thoroughly (best overnight). Spread 3 1/2 cups of pudding over cream cheese layer. Enjoy the remaining separately. If not serving immediately, lay plastic wrap directly on top of pudding to prevent a skin from forming. Just before serving, beat cream and confectioners sugar in a large bowl until stiff peaks form. Spread evenly over pudding layer. Garnish with toasted chopped pecans if desired. Time stated does not include overnight chilling time for pudding.